Well another week has passed by and this one was much less dramatic than the last well for me tanyway, no serpents this week. But it was a little more dramatic for one of our guests, hence the title of the blog. Tuesday – Kevs brother Chris and his friend Carmen came to visit us, to celebrate Chris’s birthday. All started well, the weather wasn’t too bad [apart from the crazy mistral winds we had on Wednesday which wiped my plant pots from the window cills and smashed them]. We went into Albi to have lunch at Cafe Le Pontie which is one of our favourites, its on the main sqaure and is very relaxed, a great place to watch the world go by and it has great food. Anyway the waiter gave us our menus and we all decided to have Pizzas apart from Chris who opted for Steak Tartare, now i must say he is very adventurous and brave to try this French delicacy, we all looked at him with a grimace on our faces and roughly said the same thing “are you sure its the day before your birthday” we were going to go to our local Michelin starred restaurant at the Chateau De Salettes for his birthday dinner, “you may get ill from it” said i, but no he had decided that is what he wanted, and when it came it looked very presentable and very raw! We all tucked into our pizzas and Chris picked at his raw beef oh and it had a raw egg on top as well….mmmmm….not! Anyway we finished our lunch and had a lovely afternoon meandering around the city looking at the sites and shops. Thursday – Chris’s birthday and oh dear what your not feeling that good, oh dear, no it couldn’t be could it, not the steak tartare making an appearance, oh dear, poor boy spent most of the day saying ta ta to the steak tartare. Hence no Michelin starred restaurant for us and no food at all for Chris, poor thing, we celebrated his birthday for him, wine tasting, eating, shopping and making merry. But by Friday he was feeling much better and even managed lunch out in Gaillac and a few drinks at cafe Joubert. He departed on Saturday healthy and a few pounds lighter, which he was more than happy with. Heres what happened the rest of the week. We found a fabulous bargain at Troc our local second hand store, its a French version of a Welsh dresser, it needs a bit of attention and will look much nicer painted French grey. Its going to live in our new kitchen and house all our crockery. 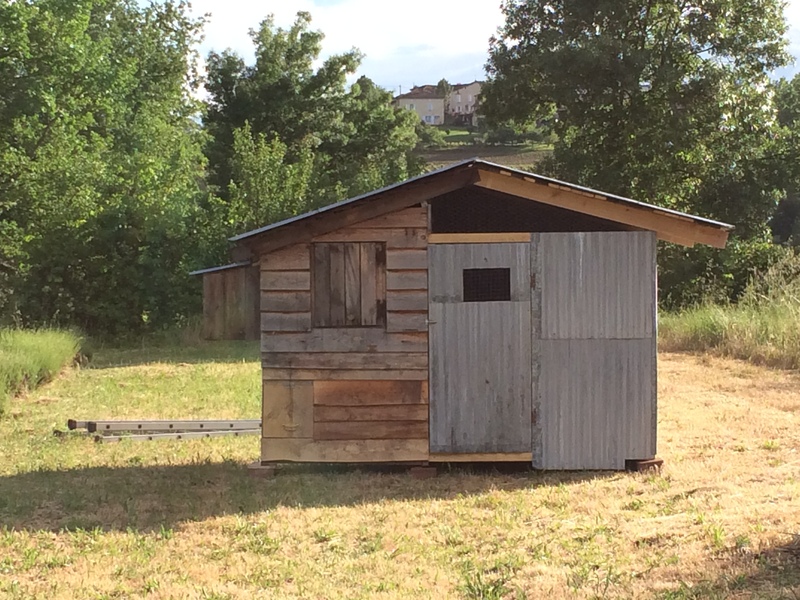 We popped to our local cafe Joubert for a glass of rose and Bernard the owner had been very busy making a hen house, so fresh eggs on his menu soon. 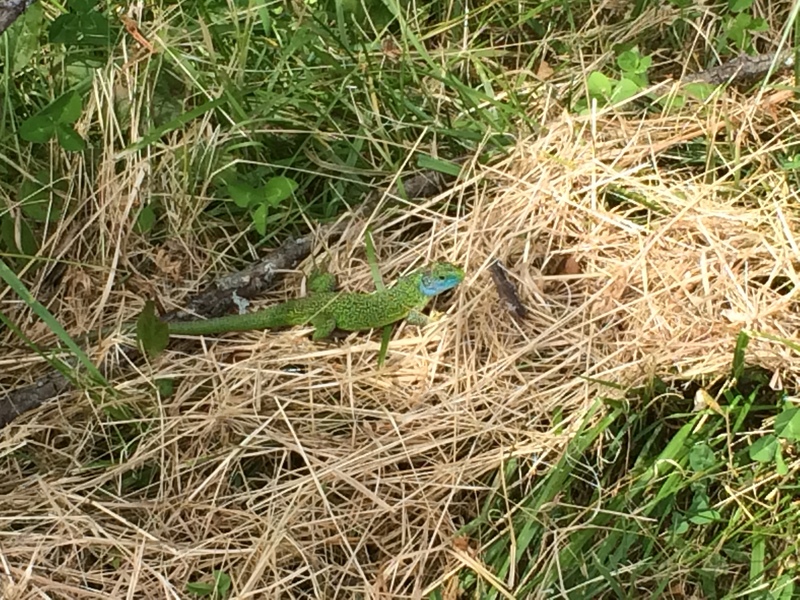 No Le Serpant this week but i did see this beautiful looking chap whilst out with Barnaby Pickles today, he was about a foot long which is the biggest lizard i have seen here, he was enjoying the sunshine. 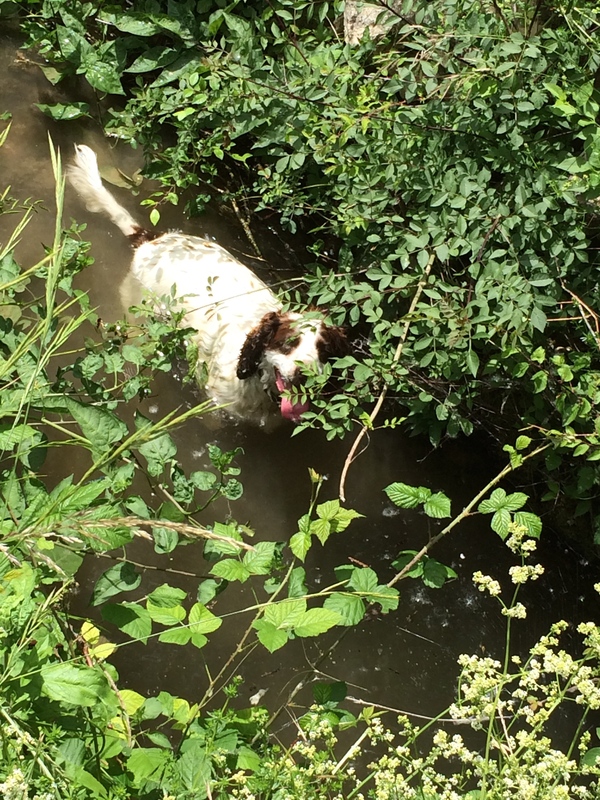 After chasing lots of birds in the fields master pickles was so hot he decided to sit the the stream for five minutes, i couldn’t get him to shift not even at the mention of deer to chase or treats, no he stayed put cooling off. 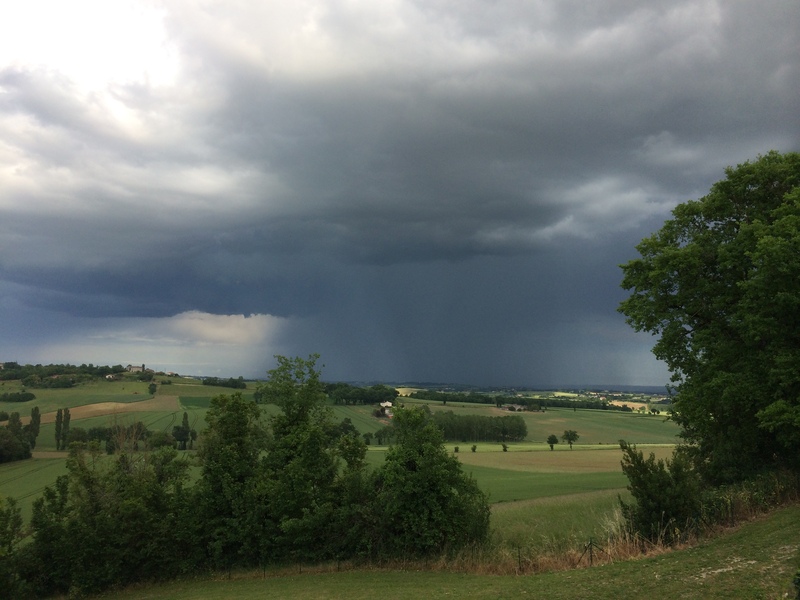 And after a beautiful hot day i was treated to an amazing thunder storm which passed our village by but gave a great light show and lots of very loud thunder. And now some rain to end the day which is great as i don’t have to water the garden, thanks mother nature. Happy end of the week everyone, heres to the next one. Thunder and lightening was pretty amazing – all the lights went out in Quillan at one point. We were lucky enough to miss the main part of the storm, i viewed it avidly from my back terrace, better than fireworks and with sound effects to. It did rain later which was good as it saved me a job watering the vegetables. Rain here all day today and looks like most of the week, just as well I’m going back to London to work for the week. Hope it clears up for next week though i have family visiting. Ive just joined your blog and have read some posts, its really great and it sounds like you are having a great time in France. 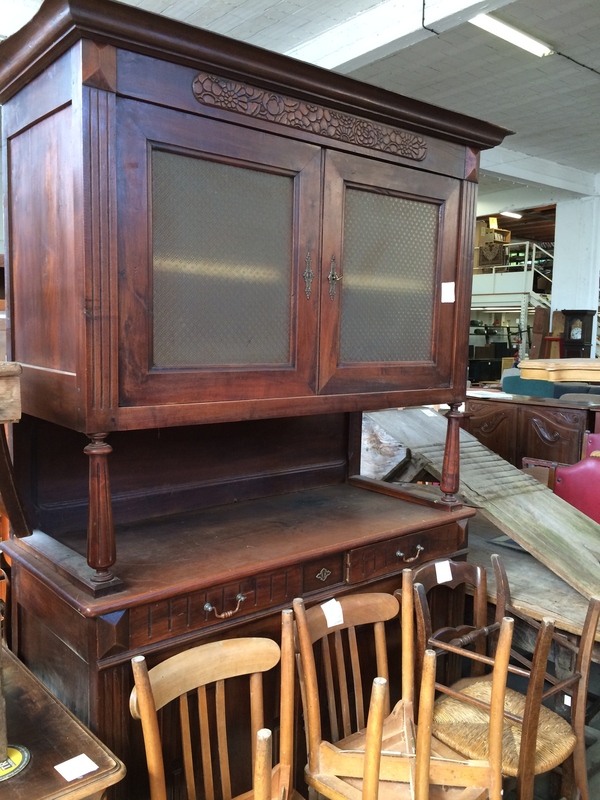 Lovely dresser, can we see it post paint job too? Just discovered your excellent blog, like the way you log the downs as well as the upstuff! Mine is turning into a bit of a confessional, but it’s better than standing in the street and ranting I guess! Thanks for following our blog, I’ve just started following yours and look forward to reading your posts. The dresser is in need of repair and its just finding the time at the moment as our renovation list is never ending, we are going to change the wooden top for a marble one and have started looking on Bon Coin for one. Ill post photos of the finished dresser.